The attack, which came amid one of Trump's familiar diatribes about the "dishonest" media, was the latest in a string of personal insults Trump has made against reporters covering his campaign. Trump has called Fox News host Megyn Kelly "a bimbo." He dubbed NBC's Katy Tur, "little Katy, third-rate journalist." 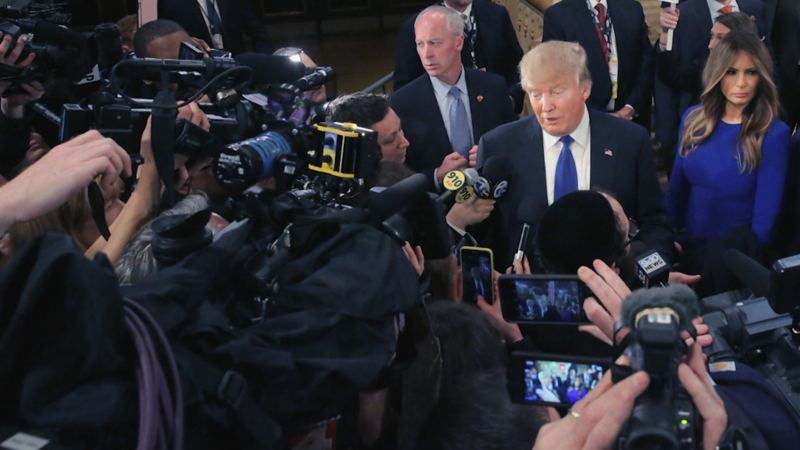 He has also individually tweaked reporters from the New York Times, Politico, CNN and elsewhere. And at nearly every rally, the brash billionaire reams the press as "dishonest," "disgusting," "slime" and "scum," calling political reporters the worst types of human beings on earth, prompting his crowds of thousands of supporters to turn, without fail, to jeer and sometimes curse at the press. Trump just called me a "sleaze." Should be an interesting week. Trump's objective here is clear, several campaign strategists and political reporters observed: To discredit the people who call attention to his lies, his contradictions, his lack of transparency and the less seemly aspects of his history. "Why attack media?" asked Michael Barbaro of The New York Times. "So you can keep saying they are 'discredited' when tough stories come out. It's deliberate attempt at inoculation." Inoculation is a tried and true tactic for Trump: When faced with a fraud trial over Trump University recently, the Republican candidate noted that the U.S. District Court Judge "happens to be, we believe, Mexican" — a not-so-subtle signal to his supporters that the judge was likely biased against Trump because of his controversial remarks about Mexican immigrants. By railing against the media, Trump also stokes the anti-media fervor of his base (which puts little stock in anything the media says) and deflects attention from his own shortcomings — in this instance, the fact that he did not raise the $6 million for veterans groups until forced to do so by pressure from the media. A day spent talking about Trump's relationship with the media is a day not spent talking about his own controversies. "If the collective take away from Trump's [press conference] is that he hates media and the media spends time fretting about this, then he's met his goal for today," tweeted Chuck Todd, the NBC News political director and moderator of "Meet The Press." The press corps seems to be growing increasingly impatient with Trump's ability to spin every objective inquiry about his campaign into an attack on the "dishonest" media. At Tuesday's press conference, one exasperated reporter asked if he intended to keep up the anti-media screeds if he became president. Trump was unequivocal: "I'm going to continue to attack the press," he said.